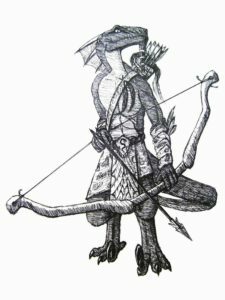 The fearsome, combative, plains-dwelling Kala people (think lizardfolk) use well-trained archers to overwhelm enemies from the back line. As noted for kala warriors, kala prefer to find the most powerful enemy—that front-line barbarian, fighter, or paladin—and swarm him or her. The archers follow this strategy, even willing to fire through allies at the identified enemy. The archers also eliminate one of the big weaknesses of ranged combatants: opportunity attacks against melee enemies. The archer’s rapid eye feature allows it to effectively make ranged attacks as melee attacks. 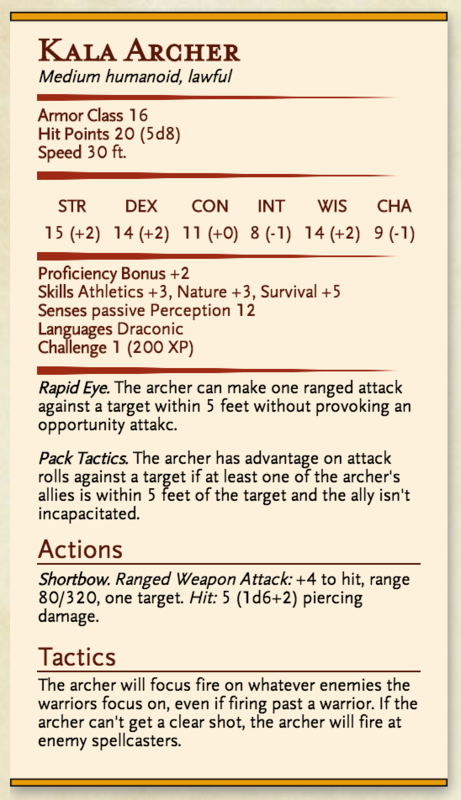 As such, if you’re adding kala archers into your campaign, beware that they’re quite a bit more powerful than your standard ranged monster. Use fewer than you normally would until you’re sure of how the PCs will deal with them. Rapid Eye. The archer can make one ranged attack against a target within 5 feet without provoking an opportunity attakc. Shortbow. Ranged Weapon Attack: +4 to hit, range 80/320, one target. Hit: 5 (1d6+2) piercing damage. The archer will focus fire on whatever enemies the warriors focus on, even if firing past a warrior. If the archer can’t get a clear shot, the archer will fire at enemy spellcasters.